On September 17th, the Marilyn Werby Gallery at CSULB was my favorite. The piece was called “Disposable thoughts”. The artist’s names are Tidawhitney Lek and Daniel A. Rivera Echeverria. Here is a picture of their work. Tidawhitney and Daniel worked together to make this creation out of napkins. 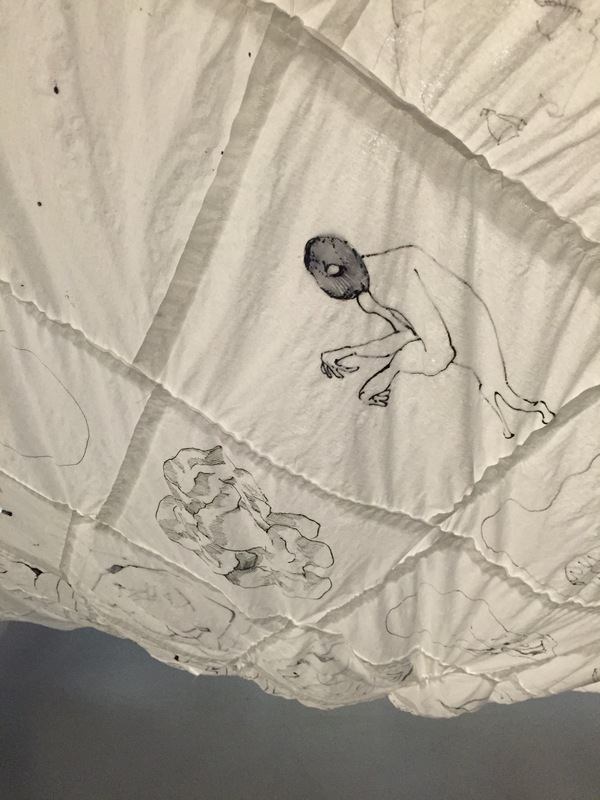 They sewed the napkins together and used fishing wire to install their work in the gallery. 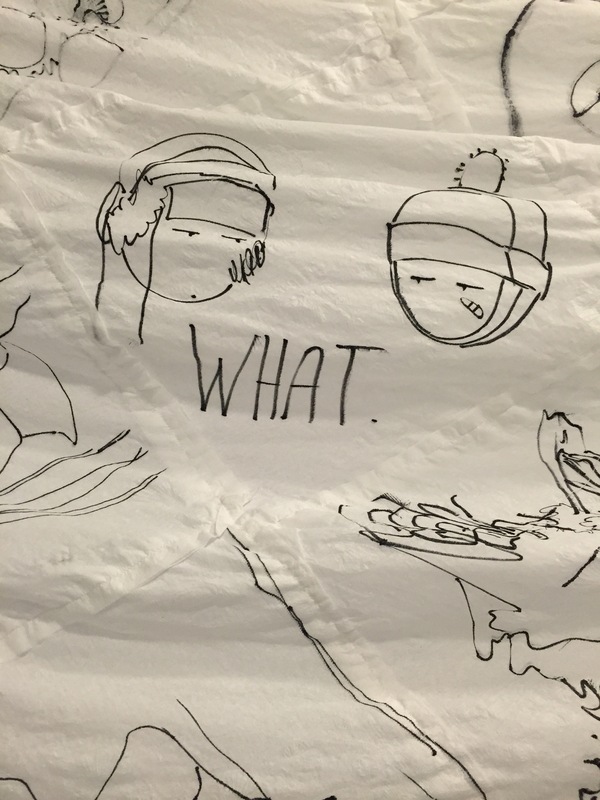 What their piece is about is expressing their thoughts on a napkin. 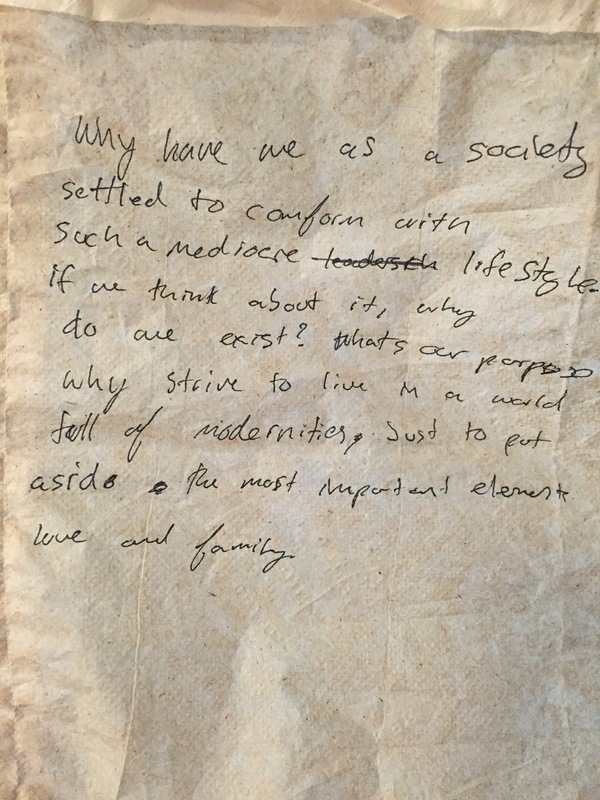 On the napkins it was a mixture of writing and doodles. They used markers to write down lyrics or quotes from a movie and drawings. I talked to Tidawhitney and she said that it’s about confessing what is in your head. She said it was similar to a diary. She talked about how we all know that we have thoughts and that they are there but there’s no physical form of our thoughts. 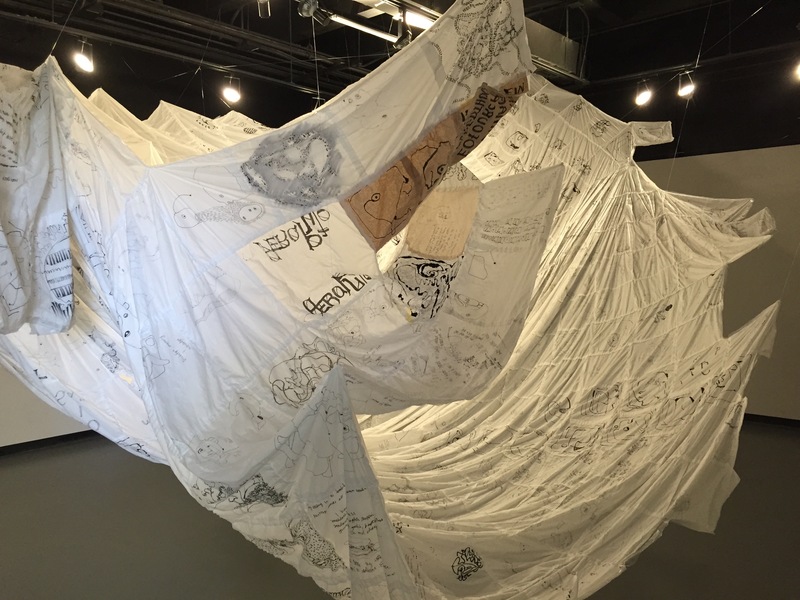 Tidawhitney and Daniel’s work shows their thoughts in physical form(napkins). Tidawhitney said “Never seen my thoughts all in one place”. It made think about how our minds are always thinking about stuff and if it had a physical form it would be this piece. She explained her struggles with this piece which was thinking about what to draw. She said that there were times that she was so focused on what she was drawing or writing that it made the process much easier. The idea started in the summer and they officially began their creation at the end of summer. Tidawhitney and Daniel had 1,000 napkins to express their thoughts on and it took them many hours to complete. The installation of this piece also took many hours. Their purpose to set up their art this way, was for the audience to think they are going inside of a tunnel and to see inside their minds from different angles. 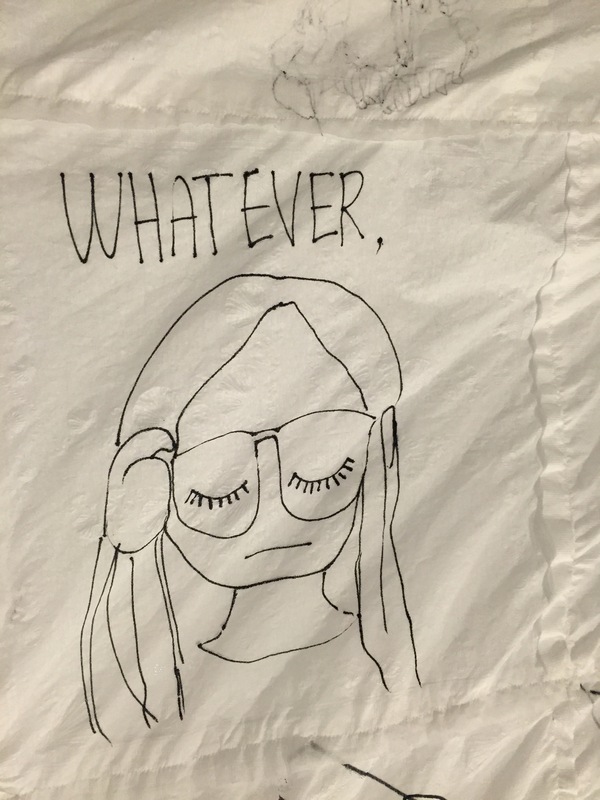 What I thought about this piece called “Disposable thoughts” is that some of the writing on the napkins I can relate to. It made me wonder what the doodles mean or if there is no meaning. When I talked to the artist it made me have a better understanding of her art. At first I thought it was writings and doodles by different people. Then I learned that it was created by two people and that I was reading and looking at their thoughts. 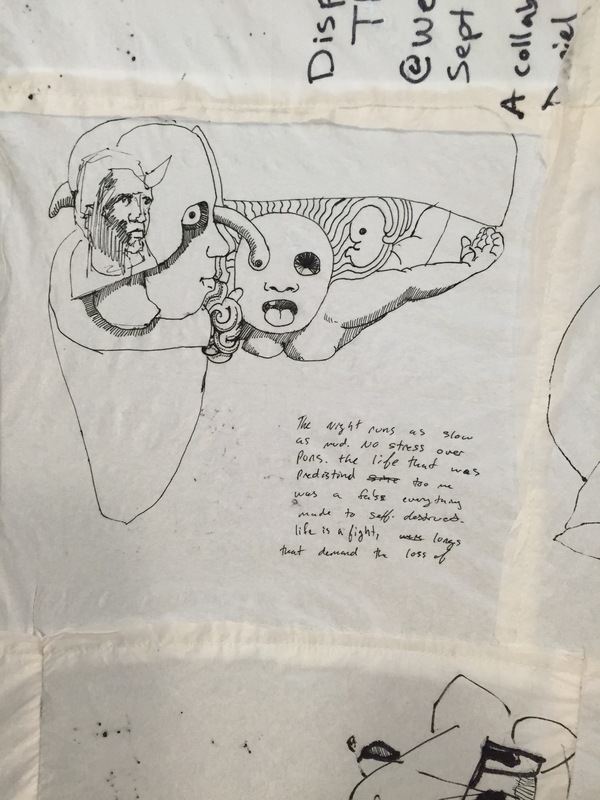 I like how you can go around or under their blanket of art and look at their thoughts on each napkin. I think there’s a lot of truth to the title of this piece because we think about so many things and our minds dispose them or puts them away somewhere. We have memories that will stick to us forever but there are some things that we won’t ever remember. I think that is why the artists used napkins, they are thrown away after they’re used. Here are more pictures of “Disposable thoughts”.